Why everything about Battle for Azeroth's new gear system feels like a step back from Legion. We're barely a month into the launch of Battle for Azeroth, World of Warcraft's latest expansion, and things have taken a very negative turn. The initial launch was a great success, with six vibrant zones to explore, entertaining quests, and some new activities like Island Expeditions that mix up the usual endgame grind. But as I said in my review, Battle for Azeroth's Azerite Armor system is the worst part of the whole expansion, and the problem has only gotten more profound as players have sunk their teeth into the new raid and Mythic+ dungeons. Players' criticism of the system has steadily grown until this past week, when the World of Warcraft subreddit was largely dominated by a number of posts decrying various aspects of Azerite Armor. And players are right, Azerite Armor is just really, really bad—but it's not irredeemable. Keeping up with the tradition set in Legion, the previous expansion, Battle for Azeroth introduced an entirely new equipment system for players to tinker with as they leveled their characters and chewed away at new endgame systems. The entire thing centers on the Heart of Azeroth, a necklace players earn almost immediately after starting the expansion. It's the central system for how players increase their power once they reach the new max level of 120. Doing practically any activity in Battle for Azeroth—from finding hidden treasure to running dungeons—rewards small bits of Azerite, the blood of the planet Azeroth. Azerite functions the same as your run-of-the-mill experience points by leveling up the Heart of Azeroth and gradually increasing its stats. More importantly though, the Heart of Azerite is key to unlocking the latent powers hidden in the new Azerite Armor earned from all sorts of sources. It's a bit of a complex system, but each piece of Azerite Armor is like a skill tree where you choose from one of several traits at each tier based on the level of your Heart of Azeroth. When you first find a powerful piece of Azerite Armor, you might only be able to choose from traits in the first tier. Then, as your Heart levels up, more tiers will unlock and you can make more choices. On paper, it's a pretty cool idea that clearly borrows from Legion's Artifact Weapons. This is how Azerite Armor works, with each circle containing a choice of traits to lock in. The end result is that Battle for Azeroth strips a lot of flavor and fun out of each class and does little to replace it. The problem is that Azerite Armor is a piss-poor replacement for the Artifact Weapons in Legion. Their traits can be powerful, but in a very passive and boring way. Very few of these traits require players to change up their approach to combat in the way Artifact Weapons did and that makes them feel underwhelming across the board. In previous expansions, those who managed to complete a full set of raid armor unlocked an extra bonus ability that could really push their character into overdrive. It was sometimes unbalanced but it was always a lot of fun. To emphasize Azerite Armor, however, Blizzard also removed raid armor set bonuses along with Artifact Weapons. The end result is that Battle for Azeroth strips a lot of flavor and fun out of each class and does little to replace it. Not only is the reward less appealing, but how you get it feels unnecessarily grindy too. The Heart of Azeroth levels so slowly that players are frequently getting pieces of Azerite Armor that requires their Heart to be a dozen levels higher than it is. Players have to then spend exorbitant amounts of time leveling their Heart of Azerite just to unlock the traits on gear they already own. Reddit posts like these are common (click the icon in the top-right to expand). For example, TheJavaPirate posted to Reddit showing off his swanky (and supposedly very powerful) shoulder armor he found that looks like an upgrade, but actually isn't. Gear is complicated in Warcraft, so Blizzard created a system called item level ('ilvl' for short) to weigh just how powerful gear was and to help players figure out what is or isn't an upgrade. TheJavaPirate's new shoulders have an item level of 370, which should be a massive improvement over his meager item level 325 shoulders—except that his Heart of Azeroth isn't leveled up enough to unlock any traits in his ilvl 370 shoulder armor. Because of that, this amazing piece of gear is actually a downgrade over what he is currently wearing. Right now it feels pointless to challenge Battle for Azeroth's most difficult activities, like the new Uldir raid, because there's no guarantee that the coveted loot that drops will even be an upgrade. That's not the only problem people are having with the system, either. While item level is supposed to make it easy to know when loot is an upgrade, the way these traits work actually has the opposite effect. Case in point: Many players are finding out that seven-year-old pieces of armor are more powerful in certain situations. That's without mentioning that players have earned the exact same pieces of Azerite Armor that, for some weird reason, have different Heart of Azeroth level requirements to unlock their traits despite being the exact same item. 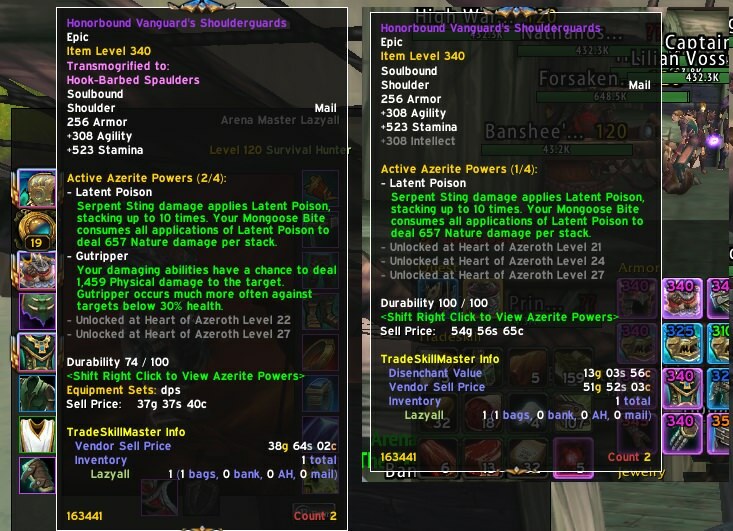 Some players have earned Azerite Armor that, bafflingly, doesn't even have any traits—making the item effectively useless. A few clever players found out that the bonuses offered by Azerite Armor traits can stack and, for a time, were specifically building their gear to maximize this potential. This resulted in some classes being so outrageously overpowered that, for a time, Blizzard had to cancel the new PvP competitive season while they hotfixed the issue. So many of parts of Azerite Armor system are broken that the community has started making jokes like asking when Battle for Azeroth is launching, implying that it's still in beta. Players are unsubscribing from WoW in protest (click the icon in the top-right to expand). Why would I bother farming up my Heart of Azeroth when the Azerite Armor it empowers is so underwhelming, confusing, and broken? The pursuit of powerful loot is central to what makes World of Warcraft fun. While tackling raid bosses is an enjoyable challenge by itself, the potential of getting a powerful new item out of it is really what motivates players to log back in day after day. More powerful gear enables you to tackle more difficult challenges, which in turn earns you more powerful gear. When that system is working, World of Warcraft is a satisfying loop that can makes hours of every evening melt away. But Azerite Armor is so busted in its current iteration that it robs players of the incentive to take on increasingly difficult activities. Above: WoW YouTuber BellularGaming has an excellent breakdown of the problems players have with Battle for Azeroth. When such a crucial part of an expansion is broken like this, it really has a way of coloring player opinions on everything else. Take Island Expeditions, for example. This new three-player activity tasks players with exploring an island and collecting a certain amount of Azerite before a team of highly intelligent AI foes can do the same. I really like the system, but right now it's the last thing I want to do while playing because its sole reward is Azerite for the Heart of Azeroth. Why would I bother farming up my Heart of Azeroth when the Azerite Armor it empowers is so underwhelming, confusing, and broken? The good news is that the Azerite system is absolutely salvageable and players have plenty of good ideas already. I like one redditor's idea of removing the Azerite Armor trait level requirements, letting you unlock all traits immediately but having their potency scale with your Heart of Azeroth level. Others have come up with clever ideas that borrow more heavily from Artifact Weapons and raid set bonuses to make traits more interesting. At this point, I'll take anything over the current system. Earlier today, game director Ion Hazzikostas announced that he'll be participating in an Ask Me Anything on the Warcraft subreddit tomorrow to answer any player questions. I'm betting the Heart of Azeroth will be one of the first things he'll have to address. It might sound hyperbolic, but the entire progression system in Battle for Azeroth is fucked—and that negative experience bleeds into everything else in the expansion. It's a little ironic, then, that the heart of this growing resentment in the community is the Heart of Azeroth and all the ways it insidiously effects what is otherwise a beautiful and fun expansion.